About the Club and our spaniels. by Jan Irving, Founding President, Rarer Gundog Spaniel Club. The Clumber, Field, Irish Water, Sussex and Welsh Springer Spaniels are all products of that well known and loved sub-group of dogs the spaniels. The common claim is that the 'Spaniel' came from Spain, I am one of the few to dispute this. The earliest reference, which I have not personally seen, is the Duke of York's book The Master of Game written 1403 - 1413 which was heavily dependent on the Comte de Foix's mediaeval French book Livre de Chasse (begun 1387). His Grace is reported as saying"their nature cometh from Spain"he does not say their kind or family come from Spain and nor are there any supporting illustrations from Spain's earlier periods given by subsequent authors to justify their interpretations of York. Whereas the Spaniel type of dog is featured, albeit but sparingly, throughout the history of central and northern Europe and Britain. My contention is that as devoted servants the Spaniel was named to honour the devoted human valets and servants whose homeland was Spain - their nature comes from Spain. I am not alone in querying the derivation of the Spaniel family group - there have been other authors and many of whom who are well respected among them William Arkwright particularly noted for his Pointers. How is the Spaniel distinguished from other dogs - to some extent by his form. Essentially he is longer than tall, there are exceptions for example the modern Cocker is considered a square dog. He has a sleek coat, with longer coat on ears, chest, backs of the forelegs, britches, and tail; the degree of feathering varies greatly from the Field to the American Cocker; but then there is the exception of the Irish Water Spaniel with the cording and heavy body coat. The Spaniel has drop ears - but the shape varies from breed to breed, the Clumber and Welsh Springer have a triangular (vine-leaf) shaped ear, the Cocker and English Springers have lobular (long and narrow) ears. He has large, kind eyes - almost invariably. His muzzle is fairly square and short compared with the shepherding breeds. His height can vary greatly from breed to breed, compare the Cavalier King Charles to the Welsh Springer or Irish Water. His tail carriage is generally set low and carried about level with the backline - the exception that springs to mind is the Tibetan Spaniel. The thing that truly distinguishes the Spaniels from the rest is his nature: the Spaniel is a loyal, loving, compassionate, and dignified companion who revels in individual attention but also loves the company of other canine fellows particularly those of his own kind.The Sporting Spaniel family was developed to work initially with nets, falconry or archery; since the advent of the gun, then his skills have been re-developed for the new means of food gathering - and so the formation of the modern Gundog Spaniel, with a few Spaniel breeds being outmoded and relegated to the other groups. In the western world the Gun Dog or Sporting Group plays host to the following Spaniels:Clumber, Cocker, American Cocker, English Springer, Field, Irish Water, Sussex, and Welsh Springer.Only three of these have enjoyed any real popularity in the twentieth century - and much of this popularity can be attributed to fad. The Cocker, as known today, is a relatively modern development, his size allows him to easily adapt to modern society's suburban concepts. His nature is particularly endearing to those who appreciate his rather, compared to other Spaniel breeds, undue fawning, and his particularly merry moods. The English Springer was undoubtedly developed to beat the Clumber in the Field Trial. So not only did breeders achieve a very smart and dapper breed they also moulded Field Trial rules and conditions to suit the fast and dashing hunting action of the English Springer as opposed to the true to life hunting nature of one of the world's oldest and most thorough hunters. The American Cocker was developed as a show dog - ridicule and scorn from the UK ensured that a sound dog was developed that once the excess coat is removed was still capable of working. In the meantime four of our breeds have suffered greatly from the deprivations of two World Wars and claims of poor breeding ability - the fifth, the Welsh Springer, has developed slowly and quietly, its radiant coat and smart markings coupled with intelligence has only ever claimed indifferent attention it would seem to be have been shunned in preference for its close cousin the English Springer. Generally, our five breeds, have achieved great strides in the last quarter of a century. The Irish Water has achieved the ultimate in the showring and obedience, in the field it is considered a retriever not a spaniel - making it truly the odd man out. It is the Irish whimsy that carries this dog through life with the name of Spaniel, the job of a retriever, and ability, but not necessarily the inclination, to achieve in all areas of competition. The Sussex faces the greatest challenge to its survival as a breed, with a negative surge of feeling in the UK as docking can now only be carried out by a Vet and poor breeding records in Australia. Perseverance and love of a breed can reverse these fortunes - it has in other breeds (in the 1970s there were claimed to be only 15 Shar Peis in the world, today the breed is known world wide). His loving and happy nature and unique colour are essentials of this low and heavy dog. The Welsh Springer has the colour, coat and sweet nature that should make it a `best seller' and breeders are faced with a greater task then trying to conserve a breed, they must resist the appeal of the breed by carefully encouraging only the most breed loyal owners to breed and avoid the puppy farmer attitude.His versatility has also been amply demonstrated. The Field, the newest breed, which came into its own as we know it today in the 1920s and 1930s with Black Prince, has an exciting future and already has a dedicated following. He is an honest and hardworking breed, not cursed with an excessive or showy coat or flashy colouring. His success in the show ring will flow into other areas in time. The Clumber, yes my favourite, is still badly understood. He is NOT a slovenly slouch, he is a hard muscled, kindly natured, very loyal but dignified and reserved individual with newcomers. His coat is magical, white but with not just silvery lights it also has the white lights from the stars and beyond. He has great power and weight for his size.He has enjoyed success in competition in all levels except Agility which he is not suited for. All five are loyal, all five have easy care coats particularly compared to many modern breeds, all five can still be easily identified with their ancestors from a century ago, all five breeds need new owners to carry the breeds through to the new century. This is what attracts us as owners, this is why we formed the Rarer Gundog Spaniel Club - even against the current guidelines of our state controlling body. The breed numbers are few in our home state, Victoria, few across Australia - small worldwide. 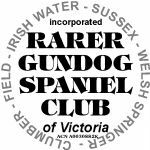 We have, and still do, enjoy the support of the Victorian Gundog Club in matters concerning our breeds but no one can expect hunt-point-retrieve owners to understand the requirements of our Spaniels, no one can expect the owners of the popular Spaniel breeds to understand the needs and requirements of ancient and rarer breeds, hence our Club.